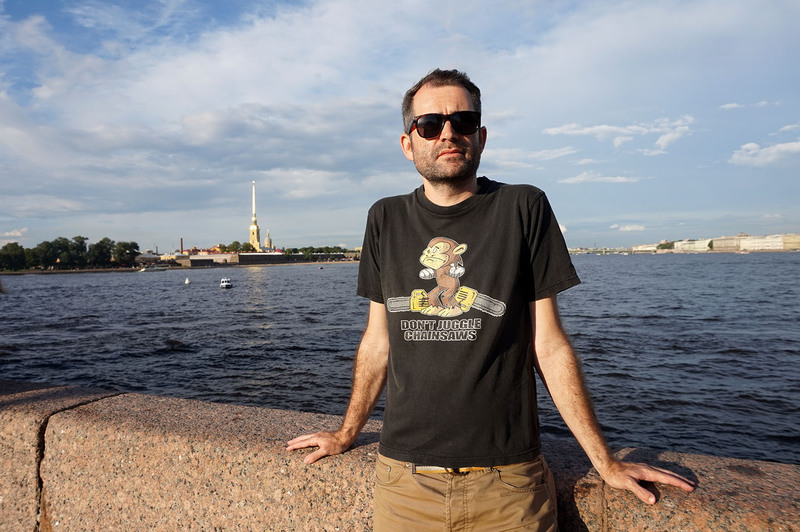 We spent a week in Saint Petersburg. Our first impression was of a monotonous imitation of a French or Italian city. How wrong we were! Each day our admiration grew. Not only does St Petersburg have countless landmarks, but the atmosphere is unequivocally Russian. Over 300 years of Russian history happened here! This is where Tsars lived in excess and the Bolshevik’s October Revolution started. In addition, nature provides the perfect frame. 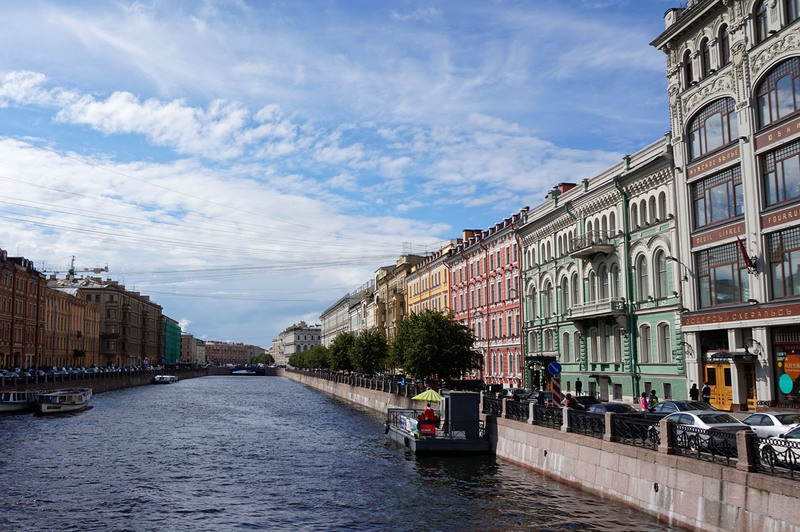 Indeed, Saint Petersburg lies on the Neva River with its numerous tributary rivers and canals. In summer the nights can be very long, thus the city’s nickname ‘City of White Nights’. Since tourist masses are everywhere, the city isn’t immune to the perils of any major tourist destination. 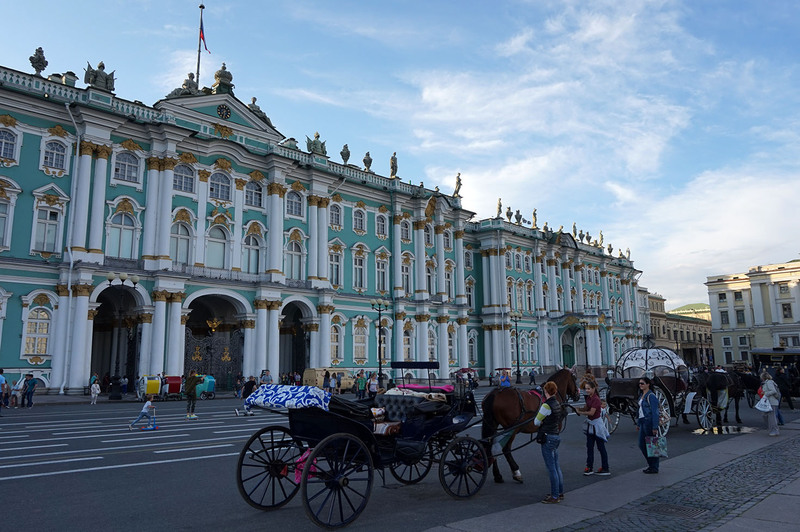 By the same token, many young people speak English so you won’t have any trouble finding St Petersburg’s main attractions. Nevertheless, you can still find fantastic spots without tourists, such as Vasilyevsky Island, across from the Blagoveshchenskiy Bridge. We witnessed many weddings and partied in bizarre Lomonosova Street (Russians do love to dance and drink!). 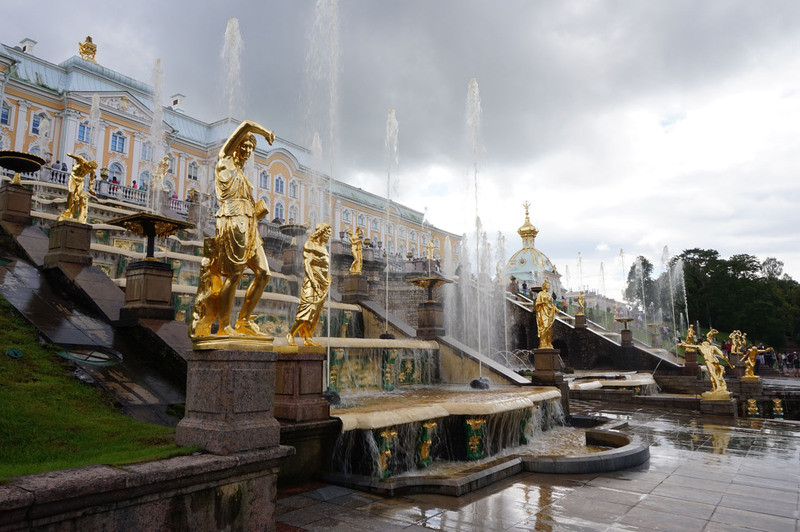 We took a boat to impressive Peterhof to feel like tourists and a train to Pushkin to feel like locals. Yes, it is Russia’s most European city, and tourists have taken over the Hermitage, but it’s absolutely gorgeous. Peter the Great wanted to lure Russian noble families into moving to St Petersburg, his new capital. However, the wealthy didn’t share his enthusiasm. What’s a Tsar to do? Peter issued a decree banning the construction of stone buildings anywhere outside of Saint Petersburg. Thus eventually the rich had no option but to build their lavish residences in the city. Those were the glorious days of unparallel wealth and creative art! What happened next? The October Revolution and World War II hit the city hard leaving most palaces in ruins. 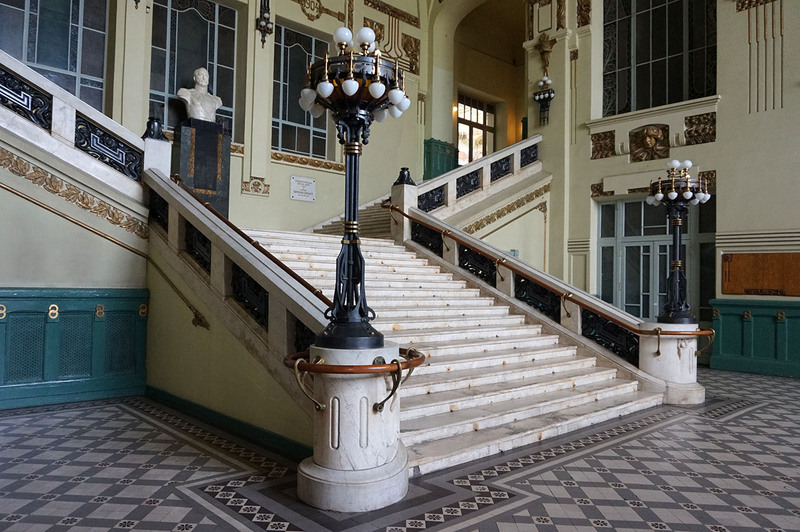 Fortunately for us, the Soviet/Russian authorities did a great job in rebuilding these beauties after the war. St Petersburg’s main attraction is undoubtedly the Winter Palace. 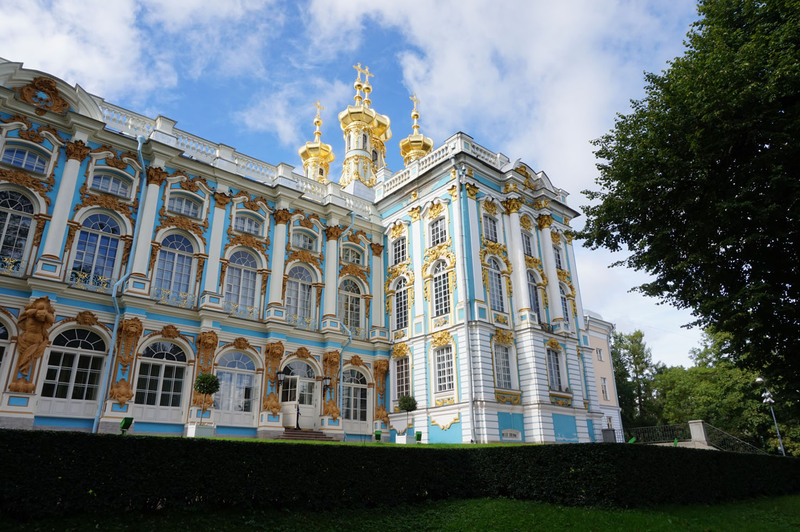 This lavish baroque building with more than 1000 rooms is home to the world-famous Hermitage. Peter built the palace for his daughter Elizabeth, who didn’t live to see its completion. From 1762 to 1917 it was the official residence of the tsars. From the October Revolution onwards it became a museum. 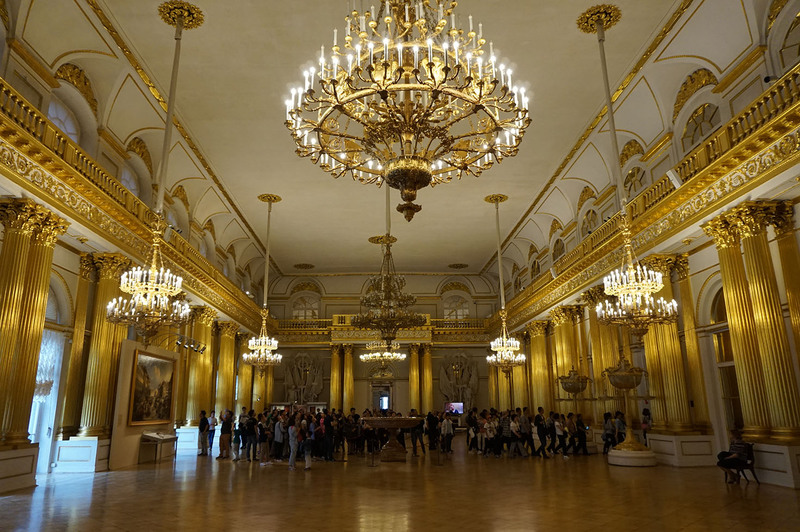 Today the Winter Palace is Russia’s largest and the world’s second largest art museum. 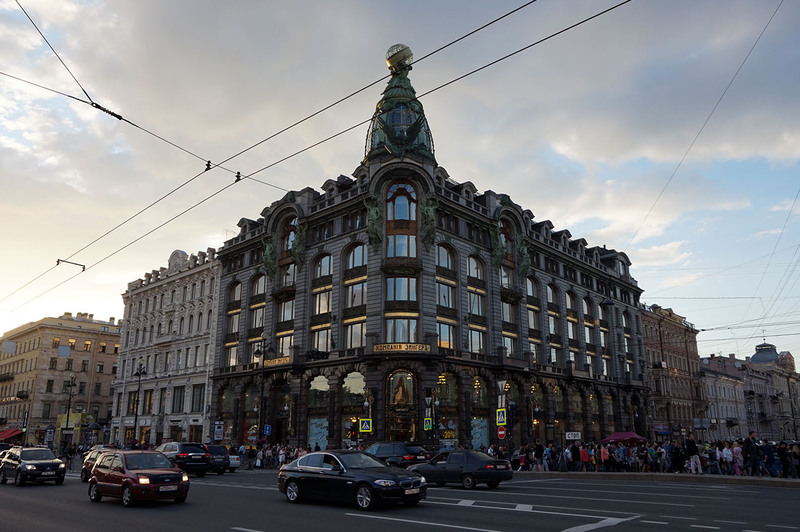 When we arrived in St Petersburg we noticed that all main streets converged into an impressive building. We thought it was the Hermitage. Boy were we wrong! It turns out that the Central building on Neva Embankment is the Admiralty. That is the former headquarters of the Admiralty Board and current headquarters of the Russian Navy. 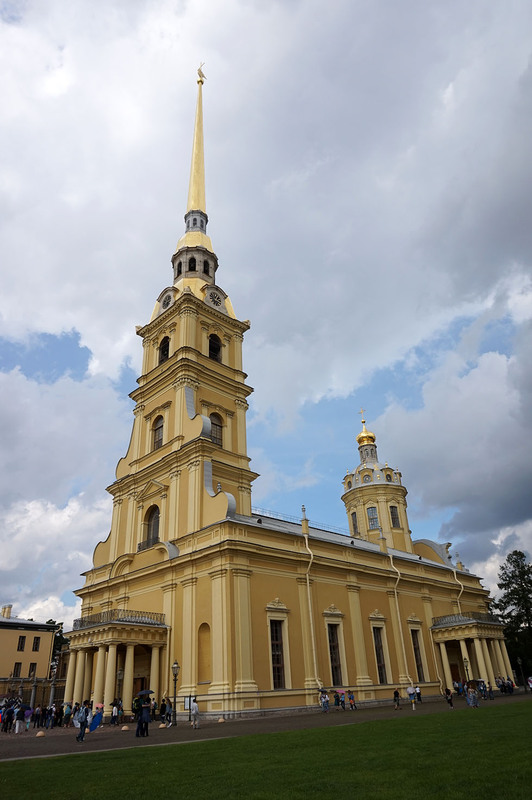 The yellow building with a tall golden spire is a fantastic example of the typical Empire Style that dominated Russia throughout the 19th Century. For classical music and ballet lovers, the Mariinsky Theatre is amongst the top theaters in the entire world. This huge building homes the Mariinsky Ballet, Opera and the Orchestra. 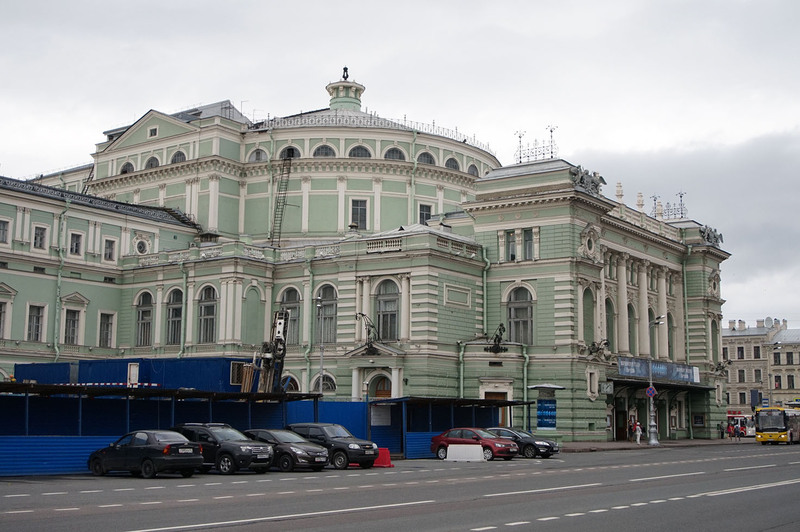 The world premiere of some of the best music ever written took place here in the late 19th Century, when it was Russia’s leading music theater. We are talking about works by the likes of Pyotr Ilyich Tchaikovsky, Modest Mussorgsky, Mikhail Glinka, and Nikolai Rimsky-Korsakov. Take notice of the neo-byzantine decorative elements all around this neoclassical building. Finally, pop in and check the shockingly lavish auditorium. 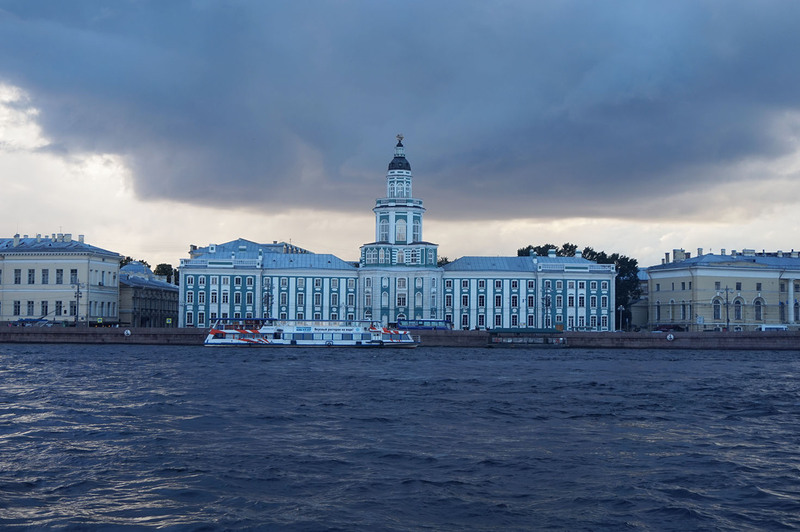 Another palace on the Neva embankment that catches your eyes is the so-called Kunstkamera. It was the first museum building in the whole of Russia and now it houses the Museum of Anthropology and Ethnography. The highlight of the baroque facade is a tower with a sphere on top representing the planetary system. Peter the Great founded the museum himself and he was also its first collector. Today, there are some 2 million items inside the Kunstkamera. Peter was building his new capital when he had to go to Versailles. The French palace inspired him. He wouldn’t be less! Thus, he decided to build a royal palace out of the city. That’s how the Peterhof Palace Estate came to be. The place includes almost 4 Hectares of land, with upper and lower gardens and the famous Cascade Fountain. The Monplaisir Palace, on the shores of the Baltic Sea, is the original summer residence. However, the centerpiece of the estate is the Grand Palace. Another equally impressive place is the Tsarskoye Selo in Pushkin. This Royal Village includes two palace complexes: the highly touristic Catherine Palace and gardens, and the little-visited Alexander Palace and parks. The former is a baroque palace famous for its amber room, a faithful replica of the original room from 1770. The later is a bit smaller and closed to visitors. Nevertheless, its park is a great place for a long walk or a picnic. 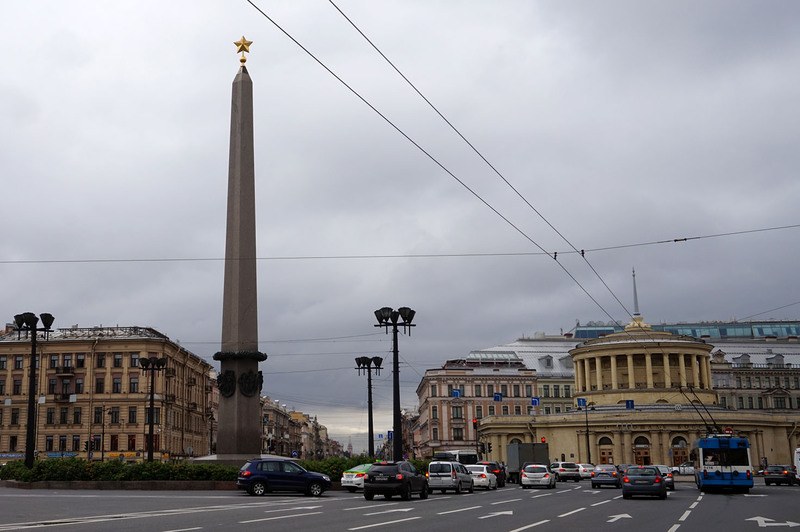 Though St Petersburg is a relatively young city, it was Russia’s capital. Thus, it has always attracted people from all walks of life. Therefore, the city houses Catholic and Protestant Churches, Synagogues, a Mosque, and a Buddhist temple. Likewise, an impressive collection of Orthodox temples populate the city, including 11 Cathedrals. Mostly built during the peak of the Russian Empire, their design is lavish and grandiose. 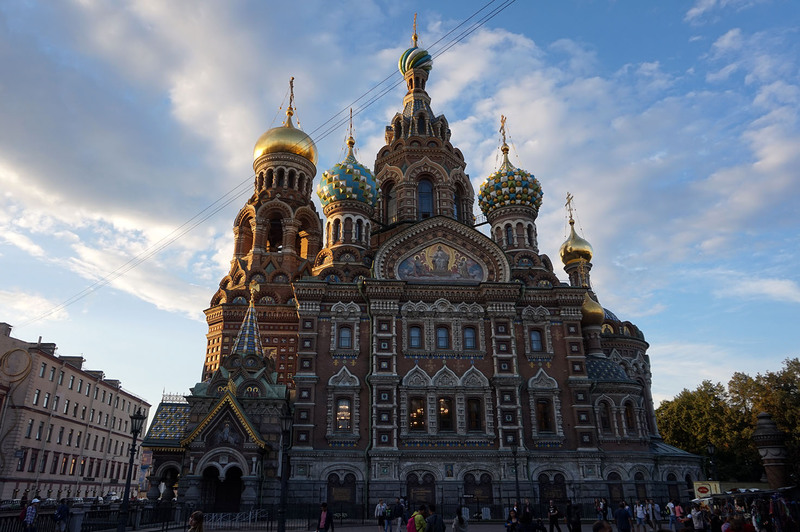 The Cathedral of the Resurrection of Christ, also known as the Church of the Savior on Spilled Blood, is a memorial to Tsar Alexander II who was assassinated there, on the spot. This church is different from other St Petersburg religious landmarks. Its baroque and neoclassical appearance incorporates elements of medieval Russian architecture. Likewise, the Cathedral has a fantastic mosaic collection, which includes biblical scenes and ornamental patterns. 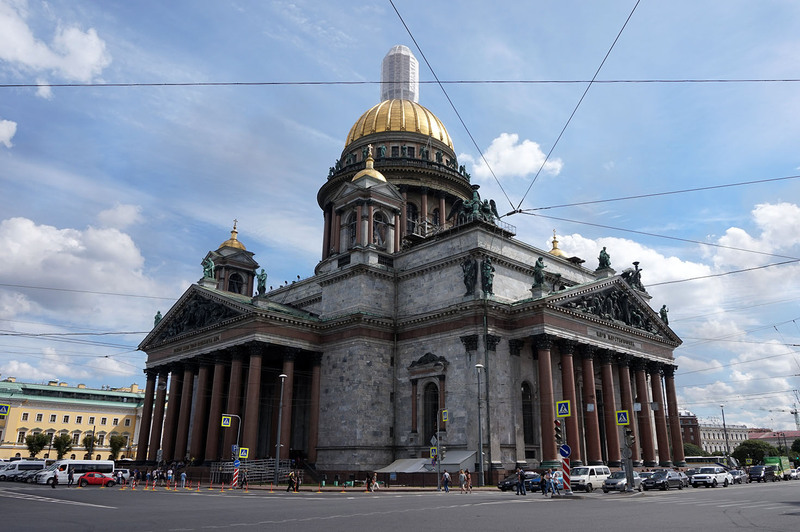 Another well known St Petersburg attraction is the St. Isaac’s Cathedral. With a height of 101 meters, it was Russia’s biggest Cathedral until in 2000 the 103-meter Cathedral of God the Saviour was built in Moscow. However, with a capacity of 14000 people, it’s still the biggest. It is a museum since 1931. Although the cathedral’s base is in the shape of a Greek cross, the west influenced everything else. Both the façade with its two giant granite pillars and the interiors are neoclassical. On the other hand, Italian renaissance churches inspired the giant golden dome. 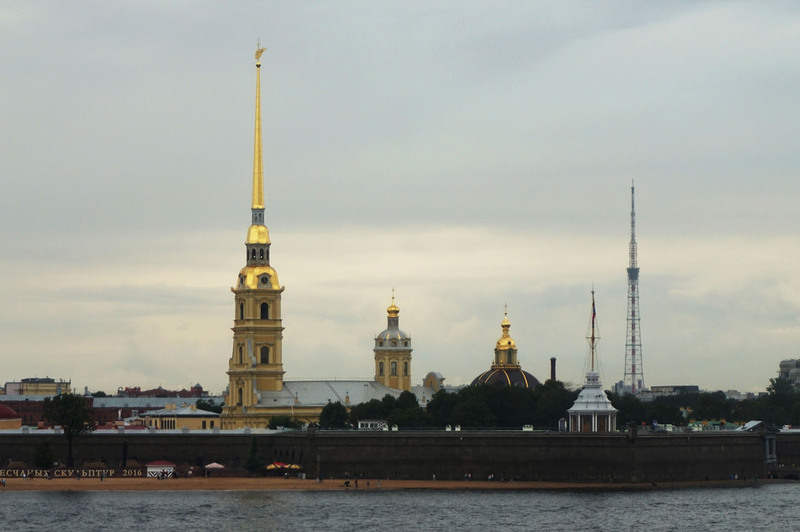 Both the Peter and Paul Cathedral and the Fortress were the first St Petersburg’s landmarks built by Peter the Great. The church was the first one in the city made of stone and its 123 meters (404ft) tall belfry makes it the tallest Orthodox Church in the world. Here lie the remains of almost every Russian tsar of the Romanov dynasty. The church’s architectural style is called Petrine Baroque. Take your time and admire the lavishly decorated interior. 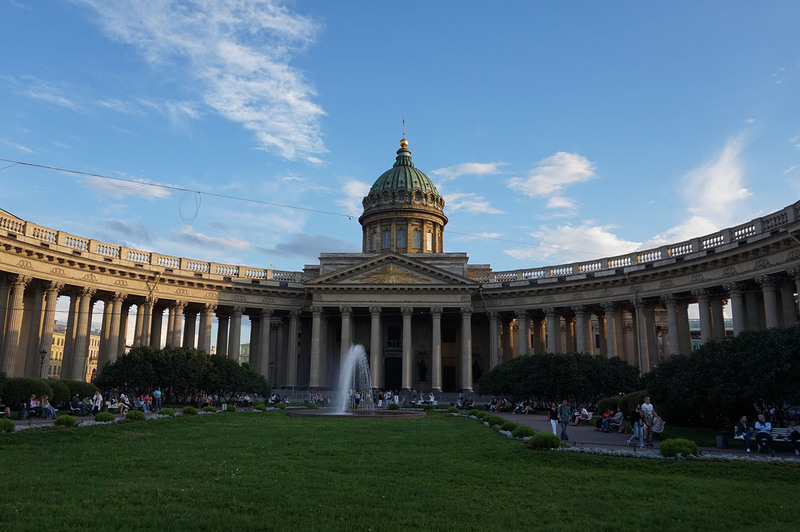 The Kazan Cathedral was dedicated to Our Lady of Kazan, a very much loved icon in Russia. Apparently, St. Paul’s Cathedral in Rome inspired the architects. However, its shape is quite unique. Indeed, note that the semi-circular side façade outshines the main one. 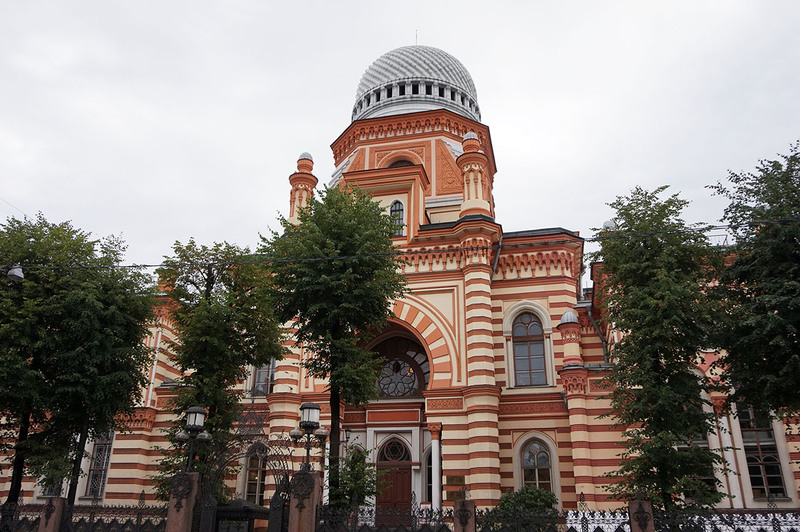 The Bolsheviks converted it into the Museum of the History of Religion and Atheism after the October Revolution. It became a religious temple once again in 1991. The remains of Russia’s most important Saint, Alexander Yaroslavich Nevsky are here. This medieval prince is credited with defeating the Germans and the Swedes. Such an important figure deserved a proper burial site. Thus, in 1710 Peter I built the Saint Alexander Nevsky Lavra and transferred his remains. Through the years the monastery grew to up over 20 buildings. Unfortunately, only 5 churches survived until today. Do not forget to check the two cemeteries within the monastery. In fact, search for the tombs of Modest Mussorgsky, Pyotr Ilyich Tchaikovsky, and Fyodor Dostoevsky. 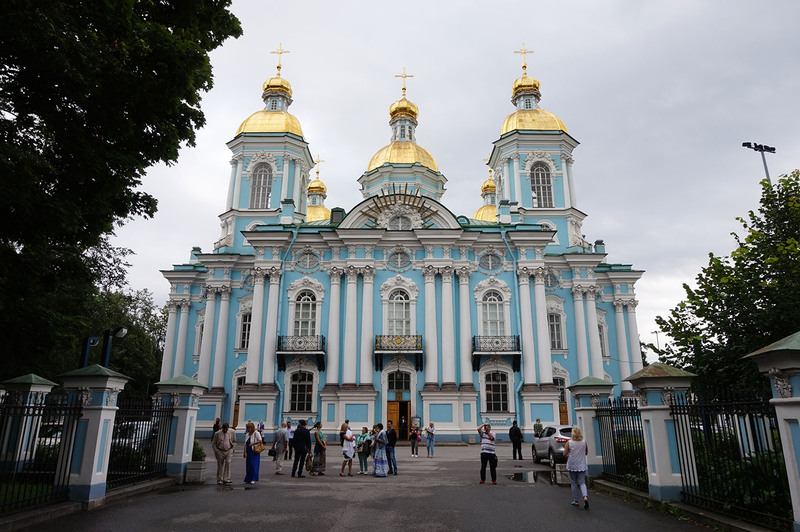 The Catholic Church of St Catherine is Russia’s oldest Catholic Church and the only one in the country with the title of basilica. 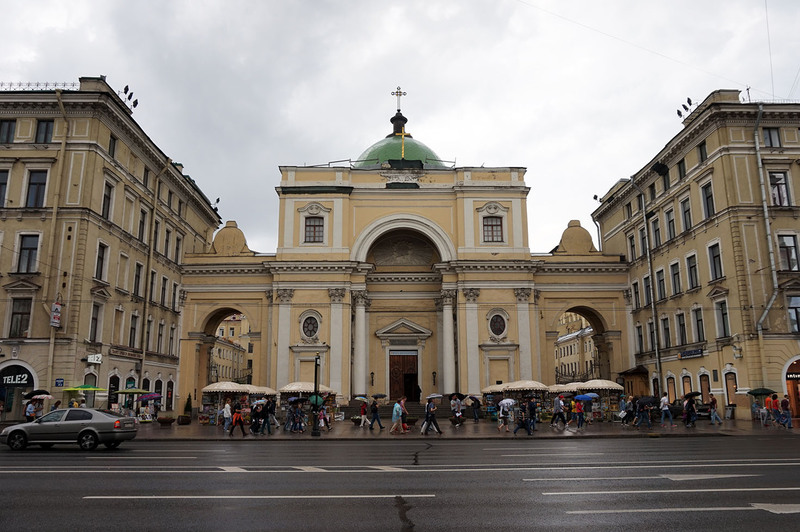 Catholic churches were not allowed in St Petersburg before 1705. Thus, in 1738 a special permit was issued to build one directly on Nevsky Avenue. A strange chain of events delayed construction for years, until it finally opened in 1783. Originally run by Franciscans it was later used by Jesuits and Dominicans. Built between 1880 and 1888 and finally consecrated in 1893, the Grand Choral Synagogue soon became the center of the Jewish community in the city. With some 3200 square meters in area and a 47m high dome, it is the second largest in Europe after the Dohany Street Synagogue in Budapest. Unfortunately, the Bolshevik’s shut down the Synagogue in 1930 and the Nazis bombed it during the siege of Leningrad. It was meticulously reconstructed and opened again in 1998. Today Jewish community institutions are established here, including a library, a kosher kitchen, and of course a yeshiva. 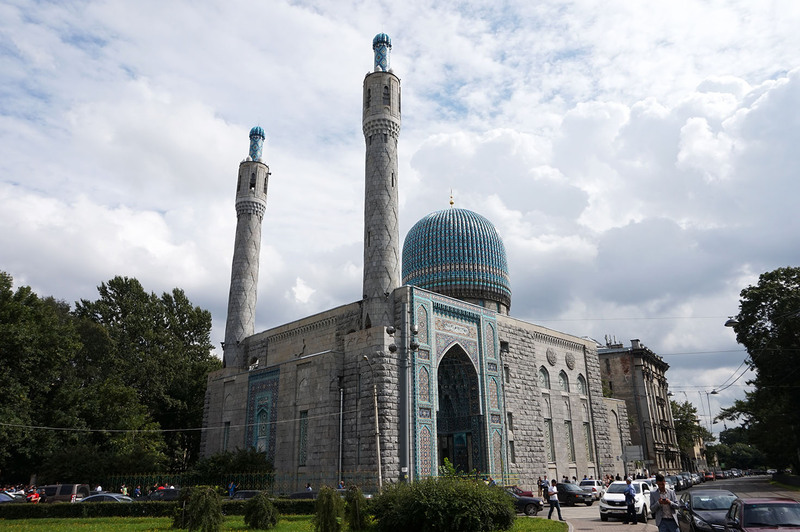 The Great Mosque of Saint Petersburg is the largest mosque in European Russia. Notice the symbolic location across the Peter and Paul Cathedral. The tomb of Tamerlane in Samarkand (now Uzbekistan) inspired the mosque. Thus the beautiful colors. Grey granite covers walls, green marble the columns and blue ceramics the domes and minarets. For a time the Soviets converted it into a warehouse. At the end of the 19th Century, a new decorative style spread all over Europe. Named Art Nouveau it brought a new take on architecture. Nonetheless, In St Petersburg, the style incorporates the National Romantic Style typical of Scandinavian countries. Many buildings have fortress-like shapes, stone towers, and folklore decorative motifs. Nevertheless, most of St Petersburg’s landmarks bear the typical Art Nouveau stamp that includes large arched windows, wrought iron decoration, and ornamental domes. While walking on Nevsky Prospect Avenue we noticed a fantastic window display with dolls dancing the Nutcracker ballet. We were at the famed Eliseyev Emporium! 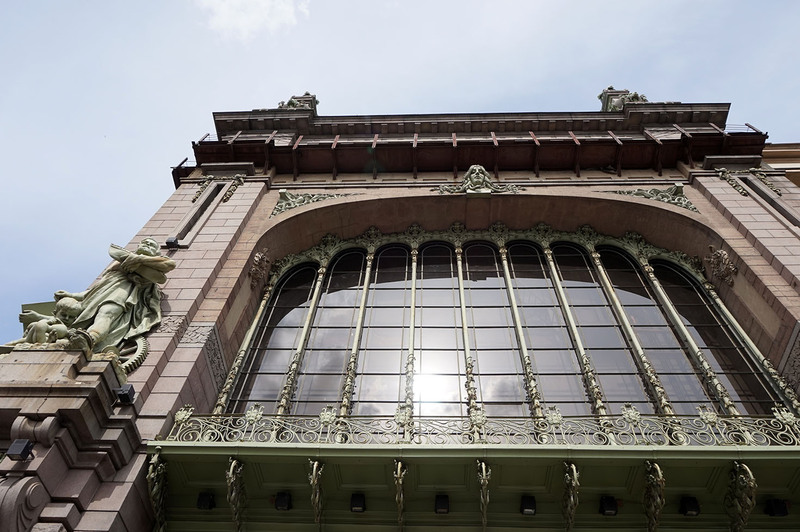 Though we love the building, we could see why people were not that crazy about it when it opened. It’s extravagantly opulent! Just notice the exquisite sculptures with science and commerce motifs. Fortunately for us, the Eliseyev Emporium is not only about looks. Their coffee and cakes are superb. 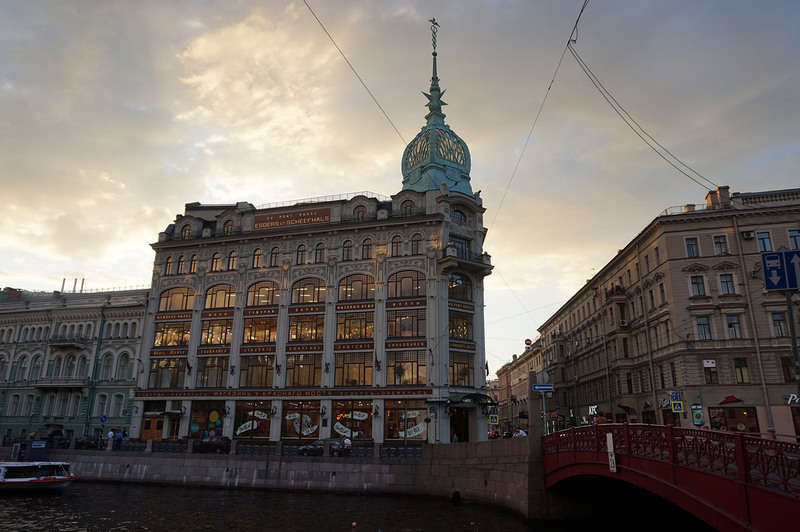 Arguably the city’s fanciest shop, the Au Pont Rouge Department Store was the first multi-storied department in the whole of Russia. As now, the Au Pont Rouge was the place where the rich and famous shopped, including no other than the Imperial Family. 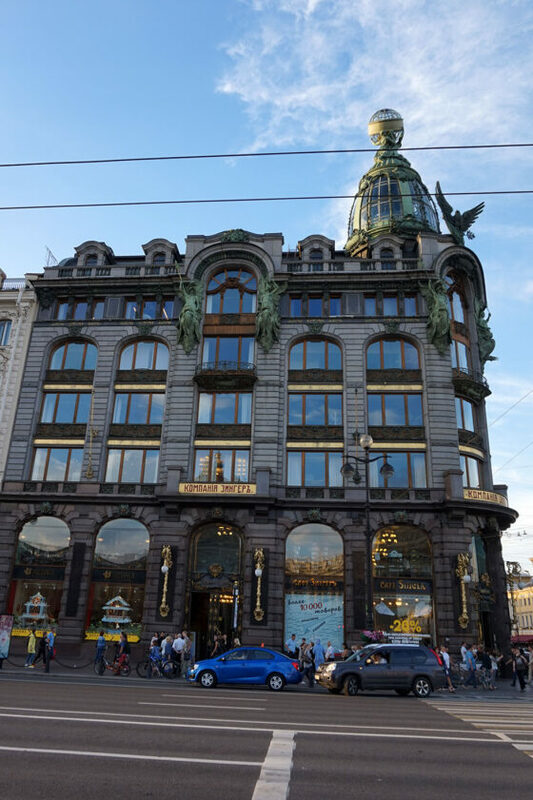 As you can imagine the Bolsheviks didn’t like the shop that much so after the October Revolution of 1917 they closed it and opened a sewing factory. In 2015 the entire building was brilliantly refurbished. If you are not into shopping, you can have some cake and coffee downstairs with views of the Moyka River. The owner of the world famous Singer Company wanted a skyscraper as the ones he had seen in the US. Unfortunately, regulations in St. Petersburg at the time prohibited tall buildings. Thus the Singers House became a six-story palace. Nevertheless, breakthrough technology was used to build the House, such as the massive steel frame around the windows. Once again the Bolsheviks closed the lavish building. Fortunately, they set up a bookstore. It remained a bookstore until today, with a collection of over 20000 books in Russian and different languages. Few people know that the first ever train in Russia departed from the Vitebsky Railway Station to the imperial residence at Tsarskoye Selo in 1837. 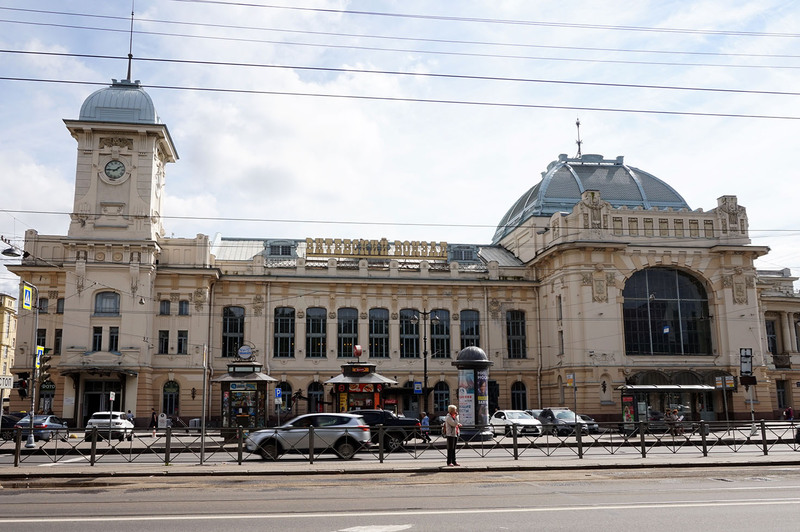 The original building, the oldest train station in Russia, was demolished in 1901 and replaced by the fantastic Art Nouveau palace we see today. Without a doubt, it is the most lavish station in the city and fortunately mostly missed by tourists. Take your time and admire the different salons. 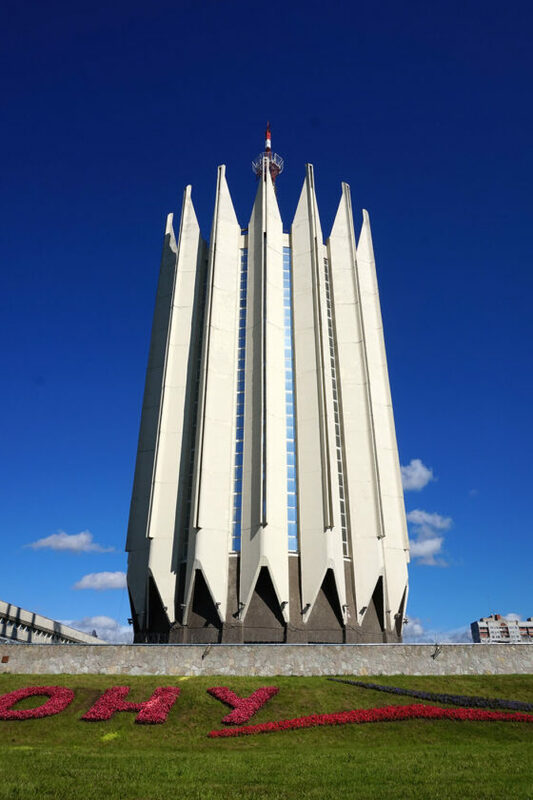 One could argue that Soviet Architecture dominates Russian cities and towns. 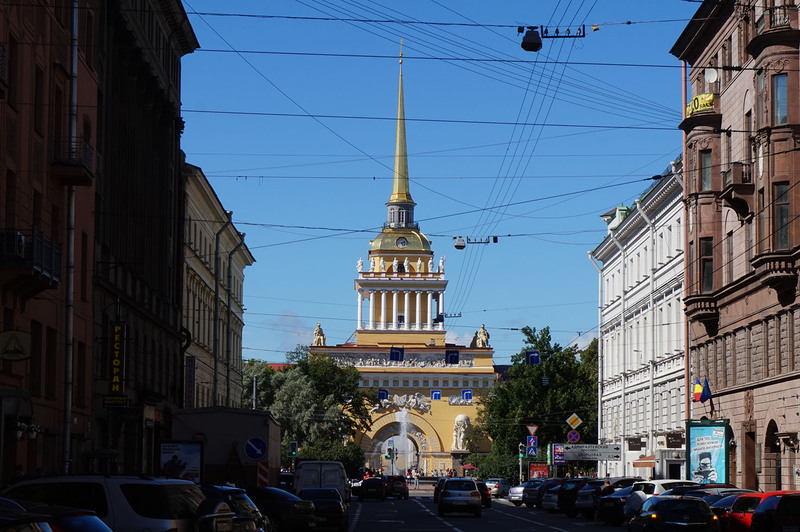 However, most landmarks in St Petersburg follow the Baroque, Neoclassical or Art Nouveau styles. Do not despair; the Soviet legacy does exist, but mostly in the city’s outskirts. Following the October Revolution, the whole concept of residential architecture was reinvented. Consequently, priority was given to low-cost large scale projects. While most of these projects have no character or charm, a few examples are brilliant. 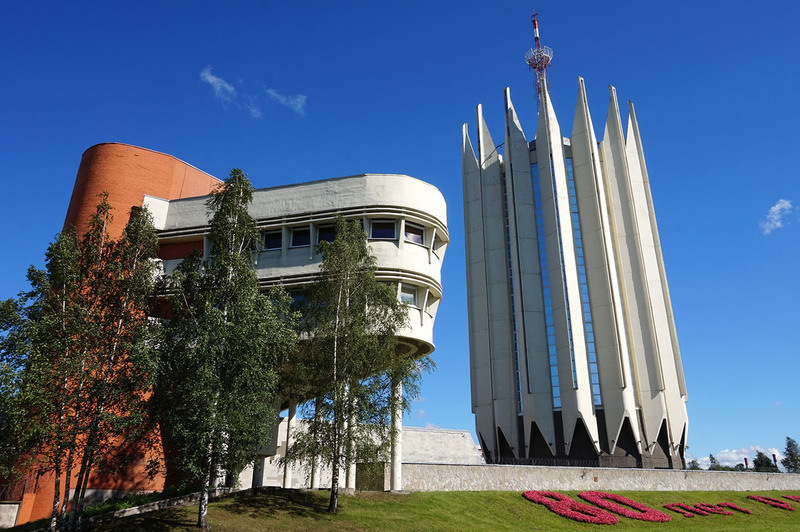 The Russian State Scientific Center for Robotics and Technical Cybernetics belongs in one of Asimov’s novels. Architects Boris Artyushin and Stanislav Savin created a masterpiece, where function conquers form. Though it opened in 1968, it looks quite futuristic. Actually, locals call the 104-meter tall tower the White Tulip. However, the building is quite alive, considered as one of the leading scientific research centers in the world. Don’t forget to walk around the gardens and check the auxiliary facilities. 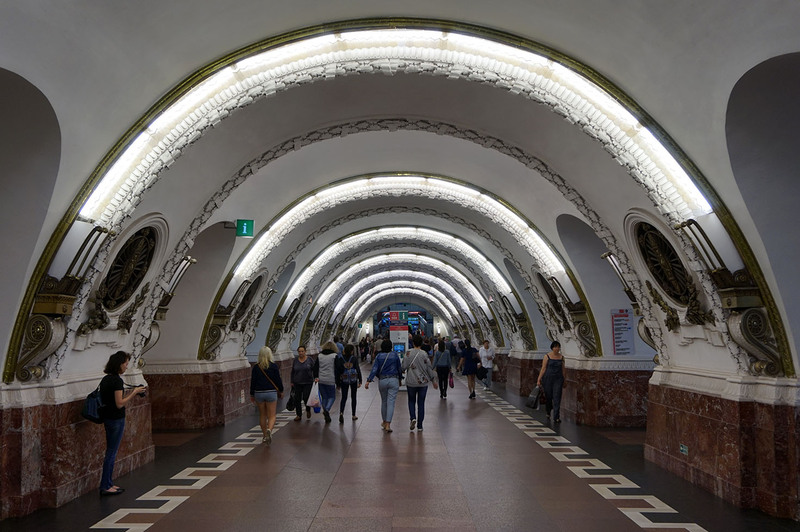 Inaugurated in 1955, Saint Petersburg Metro is the second oldest and the second largest in Russia. Due to the city’s geology, St Petersburg’s metro is buried deep into the ground. In fact, at 86 meters below ground, Admiralteyskaya is the deepest station. Our favorite stations are Avtovo, Narvskaya and Ploshchad Vosstaniya, all along line No. 1, the oldest. 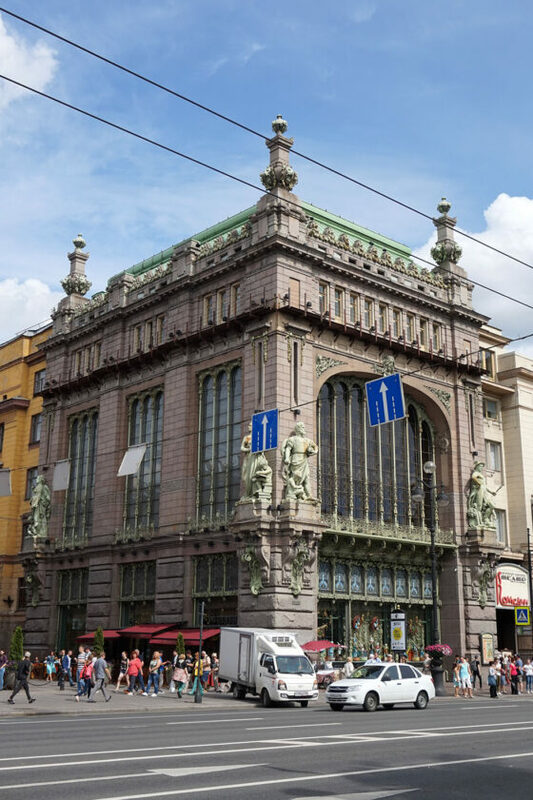 St Petersburg offers plenty of easy day trips. Most of them include a visit to the impressive palaces that dot the metropolitan area. But there are several gorgeous places located just a bit further away from that tourists still haven’t discovered. You can reach them by comfortable trains and enjoy the real Russia. 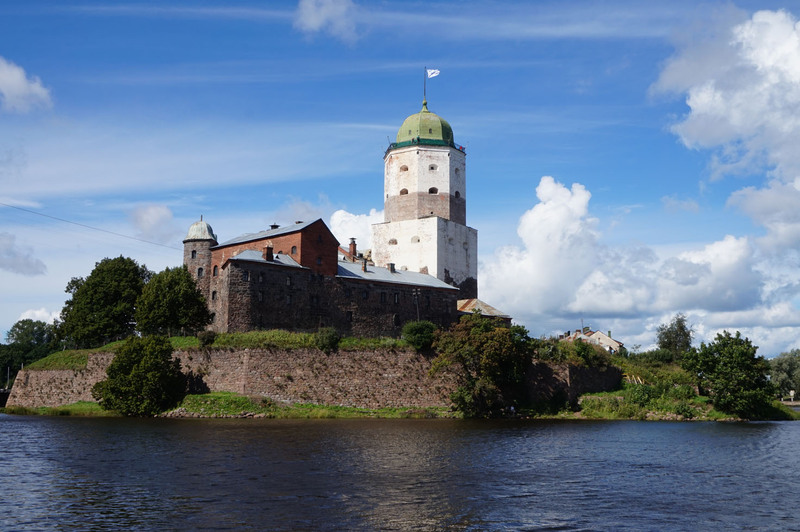 Vyborg is a splendid little town just two hours from St Petersburg. There is a 13th Century castle, a 16th Century tower, a beautiful English tailored garden, and even an Alvar Aalto building. Furthermore, nature has blessed Vyborg with fantastic scenery. Kizhi Island is fast becoming one of Russia’s most sought after destinations. The islands are located in the Onega Lake, just off the city of Petrozavodsk. 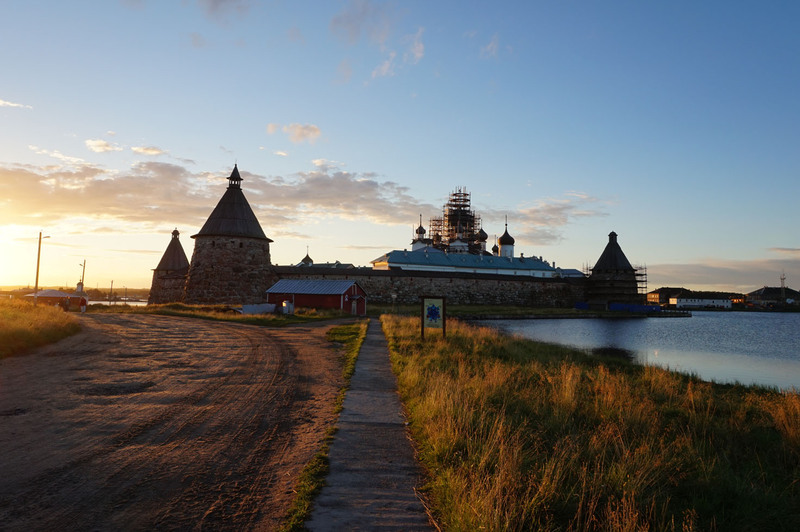 We promise you will never forget the Kizhi Pogost made entirely out of wood as well as the surrounding landscape. Granted, the Solovetsky Islands are not that close to St Petersburg. It took us 16 hours on a train to get there! 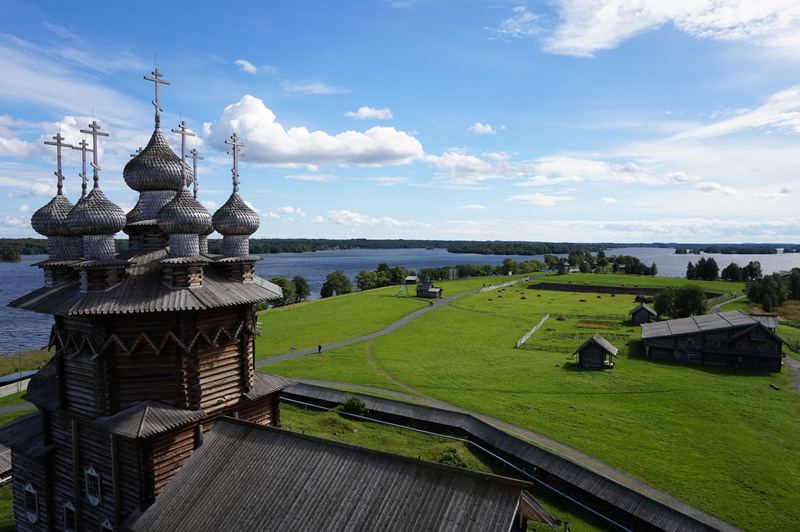 However, you can go directly from Petrozavodsk after visiting Kizhi Island. In any case, these islands are a must for every adventurer. Note that since the islands are located in the White Sea, you can only go in summer. There’s an additional perk: a 15th Century monastery! 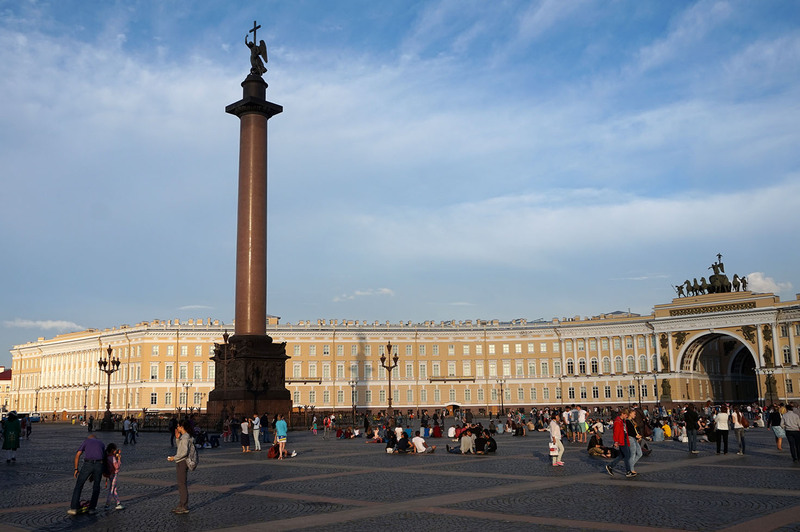 Our first hotel Deluxe on Galernaya was just a couple of meters away from the Admiralty, one of St Petersburg’s central attractions. Then we stayed in a historical house, Pushkin’s, in front of the mighty Neva River. 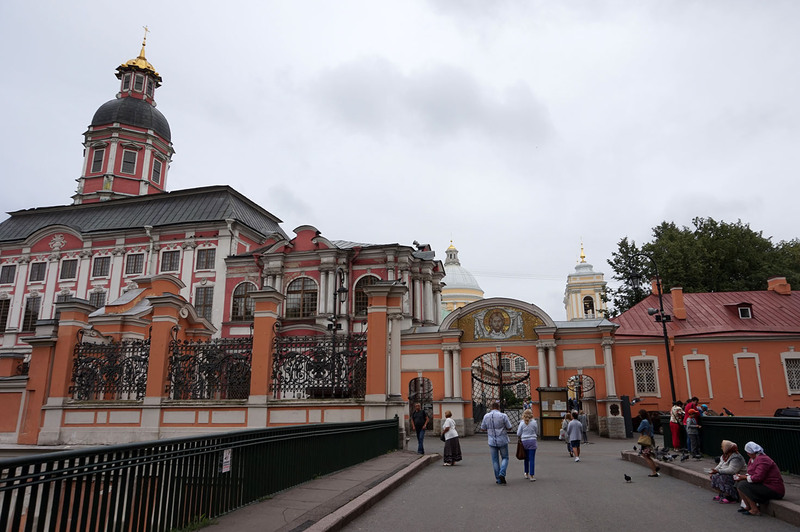 We walked to Nevsky Prospekt, along the river bank, and to and from the Hermitage. Finally, we stayed at the nearby Comfort Hotel. Conveniently located at the entrance of the metro station, it was the perfect base for exploring the city on foot and metro. A fancier option is the Renaissance Hotel, next to St. Isaac’s Cathedral. Go up to the terrace for a drink and outstanding views.